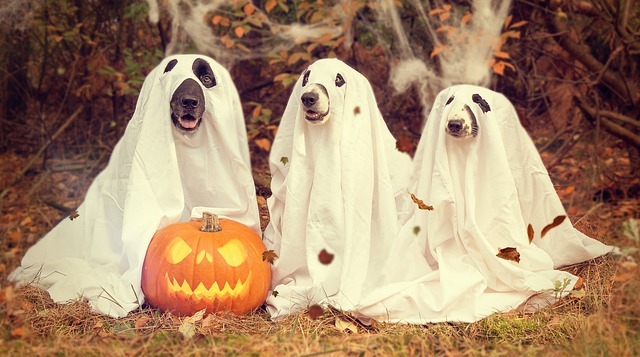 Halloween Homeopathy - Keep Your Pets and Children Spook-Free !! PHOSPHOROUS 30 and GELSEMIUM 30. One way I give remedies to my doggies is in their water bowl. I just put 4 or 5 pills into the water and they will drink away at it during the day. Otherwise, if I’m less prepared or the fireworks just start all of a sudden, I then make them up in water and just put a little bit on their nose. For children/adults who are frightened at Halloween, make up the remedies in a bottle or glass of water. And let them sip over a few hours. Or, if easier, just crush one pill of each remedy into powder and put directly into mouth (or mix on a spoon of water). Some do well on just Aconite alone. But Phosphorous is a remedy with a lot of fears, particularly relating to the surrounding environment (dark, noises, weather etc.). Gelsemium is a great remedy for Anxiety. For more info on Anxious Children, see HERE. Sometimes Halloween night itself can spook a child. After being out in the dark Trick or Treating, lots of fears set in. ACONITE is so good for this. There are other remedies too but try this first.